A legislator receives an otoscopic exam. The Ole Miss Handband and the National Student Speech, Language and Hearing Association, two student organizations from the Department of Communication Sciences and Disorders, along with Mississippi Speech Hearing Association (MSHA) hosted the ‘MSHA and Student Legislative Advocacy’ event at the state capitol in Jackson, Mississippi on January 28th, 2016. This event was designed to train students on how to contact legislators and advocate speech pathology and audiology. This venture was critical for the professions of speech-language pathology and audiology due to growing student awareness and involvement for the communication impaired. The entire process of training students to advocate for their professions occurred over a three month period and in 3 phases. The first phase involved learning how to locate and initiate contact with one’s local legislators. The Lobbyist for MSHA, Stephen Clay, created a detailed plan for students to learn who their legislators were, how to contact them, and how to provide adequate follow-up contact. 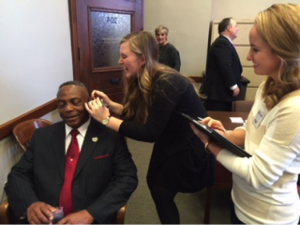 The initial contact was a handwritten invitation to have their hearing screened by college students from universities throughout Mississippi at the state capitol. The students hosted a “pizza party/letter-writing day” where they gathered and wrote letters of invitation to their legislators inviting them to get their hearing screened and eat a light lunch at the State Capitol. They also followed up the hand-written letter with a series of emails reminding them of the event. 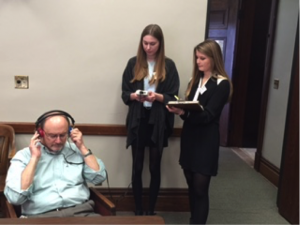 Students screen a legislator’s hearing. The actual event took place at the State Capitol on MSHA Legislative Day on January 28th, 2016,. Student representatives from Ole Miss and Southern University met with MSHA lobbyists and specific legislators, screened the hearing of legislators, while talking with legislators about the professions of speech pathology and audiology.